The profession is SO competitive now, if you can come up with a plan of how you'll move through it then it's worth doing so, even in the knowledge that it's perfectly okay not to stick to it if something interesting comes up. (I'm probably missing something useful so please leave a comment with more suggestions if you have them...) . Once you've formulated an idea as to where you want to get to (and keep in mind this may evolve or change completely as you go along, which is fine), you can start to plan how to get there. Relating to this there are two important things which I've mentioned on here before, and in talks to New Professionals. Firstly don't think of Librarianship as having a career-ladder, think of it is as having a career-climbing wall. Ladders go straight up and have evenly spaced rungs; climbing walls require a certain amount of traversing or diagonal movement, and a certain amount of inching forward followed by ambitions stretches, to get to the top of them. The example I always give is if you want to be a Customer Services manager for your library - the natural place to start is in Customer Services itself as a lending assistant (or whatever - the terminology is interchangable here but hopefully you know what I mean) but there's often a 3 pay-grade gap between asssistant and manager, with no obvious jobs in between. It's very, very rare for anyone to jump three grades in one go - so you need to go diagonally upwards so you're high enough up the grade structure to get a high-graded role, whilst trying to retain the relevant experience necessary to become the Customer Services manager. This improvisation and flexibility is not very ladder-like, and much more akin to a climbing wall. So to the point of this post, the Organisatinal Chart (known also as Organisational Structure, Staffing Framework and, apparently, an 'organogram'). The Organisational Chart shows how the hierachy of any given organisation works - who is at the head, who is responsible to and for whom, how the teams fit together, and who manages what. It's quite hard to get hold of ones for organisations you don't work for, so I'd recommend finding your own library's (it's probably in the intranet somewhere...) and saving a copy into the same folder as your ideal job spec. Obviously libraries in different sectors have very different charts, so if you're aiming to work in the academic sector then a public sector chart may not be of much use to you. I can't find a single Creative Commons example online (for obvious reasons) so here's a link to a publicly available chart for a big library. Obviously the point of this chart is to detail the positions and how it all fits together, but for the excited new professional it's a chart to literally plan an upwards trajectory with a highlighter pen (if you print it out - I wouldn't recommend using one on your monitor). Ask yourself, which of the higher jobs than mine can I get next? Does it lead to the job I really want (or the job before the job I really want)? Could I stand doing X for a year if it helped me get to Y the year after, or am I better off doing Z for two years and getting more relevant experience outside of the workplace at the same time? I think it's particularly important to look at where the tree structure stops or hits a dead-end. Look at the role you're in now - is the only position directly above that your boss? Is your boss likely to leave any time soon? If not, you need to make proper plans for progression or you'll be doing the same thing you're doing now in 5 years time. 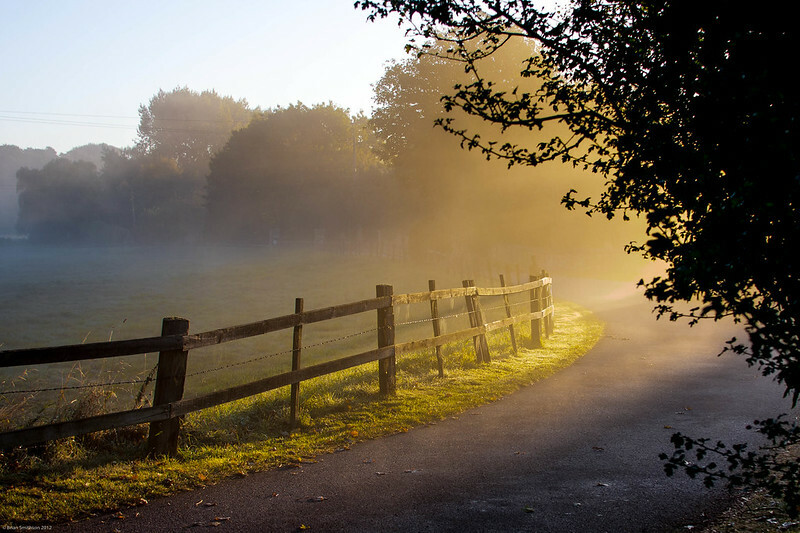 Is there a path which opens up lots of possibilities for you, as opposed to the 'dead-mans shoes' syndrome of waiting for one or two people to retire or leave? Is the division you're in one with many holds on the climbing wall or just one or two (both of which someone else already has a firm grip on)? I'm not advocating naked ambition - ambition for ambition's sake is something I'm not a fan of at all. But you DO want to be fulfilled, and ultimately you will want to earn a decent wage rather than get stuck on an okay one forever. If your current path hits the buffers in one job's time, think about the fact that you're going to be in this for 20, 30, 40 years so even if it's worthy and fulfilling now, it may not be stimulating when you're still doing it in 2020. Because as much as the rhetoric around library jobs is often about how 'none of us are in this for the money' and 'I just want a job I'm happy doing' the fact is there are lot of frustrated librarians who have just got mired in a certain part of their library and can't see an obvious path forward. So I really think it's worth being aware of what the future possibilites are, so you can start planning how you'll meet the challenges and achieve whatever it is that will make you happy. It is, in my view, much better to be happy than successful. Being the 'best you can be' is only worth it if it makes you happy - I see a lot of people putting pressure on themselves, hitting great heights, but not being overly content. But forward planning never hurts, so even if you're not aiming for Head Librarian (I know I'm not - I'm going to completely ignore all my own advice and stagnate in my current job forever, although I did a lot of the above into practice to get to this position that I actually like in the first place) then knowing what you ARE aiming for will help you stay fulfilled. Librarianship was yesterday featured in the Guardian's Beyond the Job Series. The article was entitled Beyond books: what it takes to be a 21st century librarian and was written by Emma Cragg and Katie Birkwood. I am so happy about this article! For loads of reasons. First of all, this is a brilliant piece. Here is a quote - I originally highlighted three paragraphs I really liked in order to copy and paste them, but realised that would basically be quoting half the article... Here is one bit I liked, but I liked all of it, and you should go read the whole thing. "Books are only one aspect of what libraries and librarians are about. Librarianship is a people profession; a librarian's job is to connect people with the information they are seeking, whatever format that may take. At their heart, all library jobs have a central purpose: to help people access and use information, for education, for work, or for pleasure. In all library roles customer service and communication skills are important. If anyone ever thought they'd become a librarian because they liked books or reading, they would be sorely disappointed if they did not also like people too." The article says all the things you'd want it to say, as a library professional, and all the things you'd need it to say, as someone curious about entering the field and needing to know the reality of it. Second of all, it is in the Guardian. It will be read by thousands and thousands of people, all of whom will be educated about what librarianship consists of even if they don't go on to try and become one. It is a proper bonafide Echo Chamber escape. I believe the genesis of the idea came from this post on Emma's blog, and the comments that followed. Thirdly, it mentions the Library Routes Project. Laura and I wanted to break this resource (which, if you're unfamiliar with it, documents librarians' roots into the profession and their routes through it) out of the echo chamber but have been unable to do so, really. I actually contacted the Guardian to propose an article about it, but didn't get a response. Emma and Katie have found just the right medium in which to mention it, and they got in lots of references to Bobbi Newman's Library Day in the Life Project too (you can see my video contribution to that project, here). Perfection! Since the article was published around 24hrs ago, the Library Routes wiki has been viewed hundreds of extra times - finally by some non-librarians, I hope. I sought to get this slide-deck seen outside the echo chamber as much as possible, and although that certainly happened this will really add to it - in fact Emma commented that they were going to try and link to it from a Guardian article way back then, now it has finally come to fruition. It's really kind of Katie and Emma to include a link to this, so thank you to them. As a Guardian reader since literally aged 12 (yes, I know...) and someone who literally loves the paper and the institution, being mentioned by a Guardian article is definitely (literally) pretty fabulous! So the question is, can any of us repeat this success elsewhere? Emma and Katie are presumably forbidden from reproducing their work in other publications, but there is nothing to stop the rest of us finding avenues for writing a guide to librarianship and getting it published in neutral, non-library places. Are you up for the challenge? A quick catch-up post for all the stuff I've not mentioned in previous posts but which has happened in the last couple of months. Lots of echolib stuff has been happening recently. The article I wrote a while ago for Library & Information Update has finished its embargo and so now can be made available - I've been displaying it on the Echo Chamber Netvibes page, but you can also download it in PDF format, here. 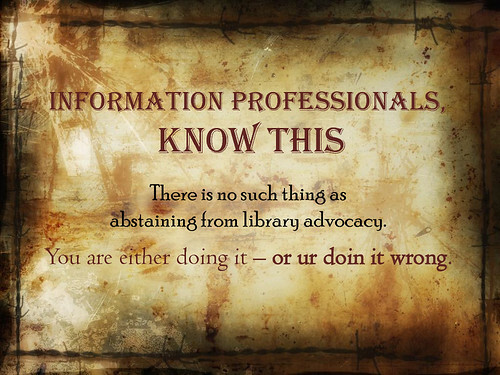 Continuing the Stealth Advocising theme from a few weeks back, I created a video version of my If you want to work in libraries... slide-deck. It has some funky hip-hoppy latin music in it that I wrote when I was about 17! Woof. Here it is - as ever, in the interests of spreading the messages far and wide, feel free to use this however you like, embed it wherever, etc etc. The Slideshare version of this has now been viewed more than ten thousand times, so surely LOADS of those people must be outside the echo chamber, right..? I also wrote an article for PostLib, the journal for retired librarians! I was really pleased to be asked to do this, I like to see the divide between senior and new professionals being bridged whereever possible. The resultant article is now available: Statistics, the Media and the Library Legacy (PDF) - and owes a big debt to Ian Clark [Thoughts of a Wannabe Librarian] who read it over for me and gave me his approval to use some of his ideas! It mentions the echo chamber in passing - but really the main thrust of it is to note that, if you take combined footfall and internet usage stats, public library use in the UK is actually UP over the last couple of years (quite considerably), contrary to popular reports. Laura and I will present a new version of the Echo Chamber presentation in Cambridge in a couple of days, to an audience of 200 or so people - the biggest we've spoken to yet, so we're really excited about that. There's also a couple of articles I wrote about LISNPN, the New Professionals Network, available elsewhere. They're both on CILIP platforms but both are freely available to all - Moving forward together opens Library Information Gazette in digital form, and The LIS New Professionals Network takes you to CILIP's Information & Advice blog. Look out for a BIG competition on LISNPN later this month, with a library-related-prize worth literally hundreds of pounds and well worth winning. Remember Library Routes? It's still going! And there's plenty of great entries that have come in in recent months - there's now over 150 contributions from Information Professionals about how they got into librarianship, and their path through the profession. Check it out if you haven't already, or if you've not done so for a while. The project homepage has more than 25,000 views now, so maybe some of those will be from people outside the Echo Chamber too. I was really pleased that Debby Raven featured me in the last but one edition of Gazette, following up on the Essential Careers Advice for New Professionals post. You can read the interview, again via the Digital Gazette magazine platform, here. Incidentally the permanent, to-be-added-to, and containing the wisdom of the people who've commented on the original, version of the Essential Careers Advice post is here on its own page of the blog - check it out and tell if there's anything that needs adding to it. What do you know now that you wish you'd known earlier? All of these articles are available together on the Papers & Presentations page of my website. I created a hectoring advocacy poster a few weeks back - it's deliberately harsh and provocative, but I do think there is an underlying truth to it. The Library Routes Project An article about Library Routes, from ALISS Quarterly, Volume 5, no. 3: April 2010. It details how the project came about, the methodology and so on - the article can be downloaded here, in PDF format. This PDF is actually the whole edition of the journal, by permission from the editor - my article is at the back, the last one in there. Why are we still defined by our building? (the short version...) The full version can be found below [on the papers and presentations page linked above]; this is a much reduced edition, published by Impact (the Career Development Group Journal), as part of the prize for winning best paper at the 2009 New Professionals Conference. Available here in PDF format. The Unspeakable Truth This is a copy of the essay which was one of the winners of the LISNews Essay Contest - it's about the future of libraries, and the positive lessons about reinvention we can learn from other industries. Downloadable here as a PDF. So if you aren't bored of hearing about the Library Routes Project, and you've sometimes wondered what the Defined by Our Building thing was all about but didn't fancy ploughing through 4000 words of the full version, this is the blog post for you!